Once final results and vet checks confirmed the standings, it was an unsurprising result in World Equestrian Games endurance. 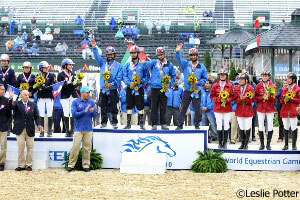 The team from the United Arab Emirates took gold easily with team members finishing third, sixth and seventh overall. The top finishing rider from the UAE, Sheikh Mohammed bin Rashid Al Maktoum, finished second, but was riding as an individual and his time did not count toward the team score. award is given to the finisher judged to be in the best condition at the end of the grueling 100-mile r ace. Frances finished fifth, but was bumped up to fourth after American Heather Reynolds was eliminated after the final vet check. The German team earned endurance bronze with consistent finishes. None of the team members made the top ten, but both Sabrina Arnold on Beau ox and Belinda Hitzler on Shagar made a solid finish just after the 8 hours and 30 minutes mark for 16th and 17th place. This is a landmark event for the German endurance team which has never won a medal in WEG competition. 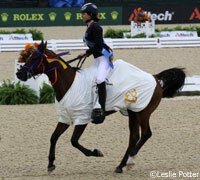 With winners finalized, it is now official that Maria Mercedes Alvarez Ponton of Spain is the individual endurance gold medalist at these games. Her victory is made more impressive by the fact that she gave birth to a baby girl just seven weeks ago. 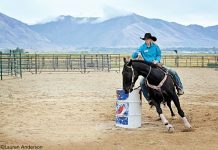 Along with her bay Arabian gelding Nobby, Alvarez Ponton has proven herself to be a formidable rider in international competition. 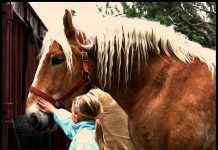 Great horses …each one in its own rights. 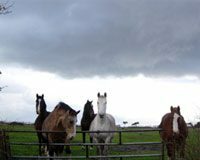 Is Your Barn Prepared for Emergencies?